I know what you're thinking. It's too early to be talking about the holidays, right? Well, stick with me here. I've been wanting to write about how those of us in the creative community can support one another for quite some time. I often find myself supporting various creative projects, ventures, ideas and products and it's an important part of my business platform. Yet, I know I can be doing more. So, I've come up with some fun ways to cheer on my fellow creatives this holiday season (and all year long)! We've all got that friend who sells his or her handmade creations at a local craft fair, right? Or maybe we know someone who recently opened a boutique? Or perhaps that local musician whose jams you have on repeat just dropped an album? I'm personally trying to be better at supporting these types of creative folks by shopping locally. There are a ton of holiday events geared specifically toward supporting local creatives, so why not see if we can get some holiday shopping done right here at home (wherever home might be for you)? 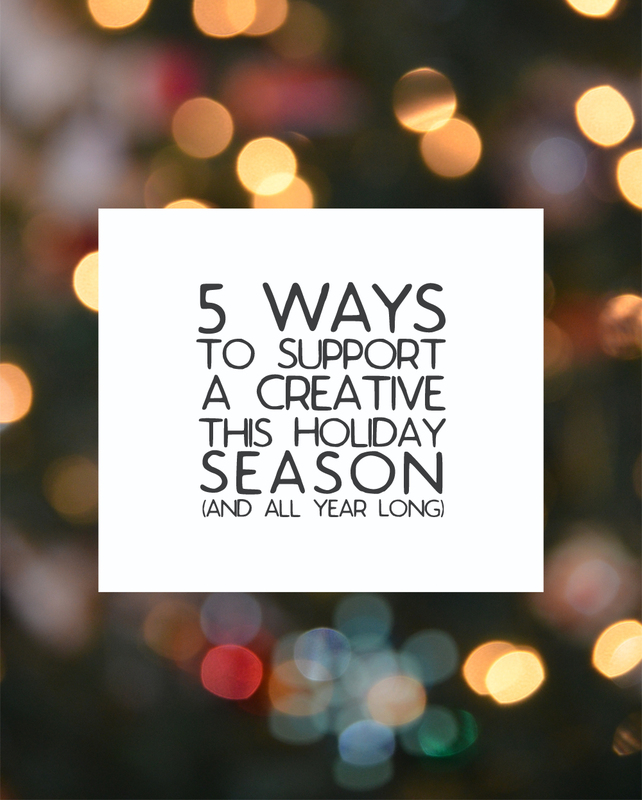 You'll be supporting a fellow creative while checking your list twice—two birds, am I right? The old saying, "those who can't do, teach" is just plain wrong. If there's anything the internet has taught me it's that those who teach these days not only do, but they do what they do very well. So well, in fact, that they decide to share what they know with all of us. If you have the time and head space for it, might I recommend taking an online class? Or why not find a class you can join locally? Learning a craft or skill can be super rewarding both in-person and online. You can explore new-to-you things or brush up on a skill you've learned and forgotten. And who knows, you just might make new friends in class! This might be my favorite way to support creatives right now. Thanks to sites like Kickstarter, GoFundMe, IndieGoGo, Patreon and other donation platforms, creatives and their peers can work together to make big things happen. While I can't possibly support every worthy project out there, I've taken to supporting the projects that really resonate with me. For example, a dear friend of mine recently launched a fundraiser for the scholarship she's created with through her business. I was so thrilled to support it! And when it comes to backing crowdfunded projects that offer perks, I always try to donate at a level that will get me something awesome in return. I've got three Christmas presents on the way thanks to a few successfully funded Kickstarter campaigns. Win, win! I realize that we don't all have the budgets to support creatives financially. In fact, I recently pulled back on my support of some projects this year so that I could support other projects in other ways. That doesn't mean I don't believe in the projects I'm no longer supporting financially, it's just my way of spreading the love! That said, I can still show my support in the form of interaction. I can follow the social media feeds of various projects and creators. I can comment on their blog posts and share links with my followers. I can leave reviews wherever possible and tell friends (yes—real, live people!) about their work. As a content creator, myself, I can tell you that this form of support means more than you'll ever know. So, friends: how do YOU like to support creatives throughout the year? I'd love to know what you think and if I've missed anything, feel free to share it in the comment section below! Please Welcome Melanie Biehle: The 2017 CYOP Artist Resident! 100 Days of Discussion Books Are Now Available! Want to Get Involved in the CYOP Listener Video Project? Watch This!